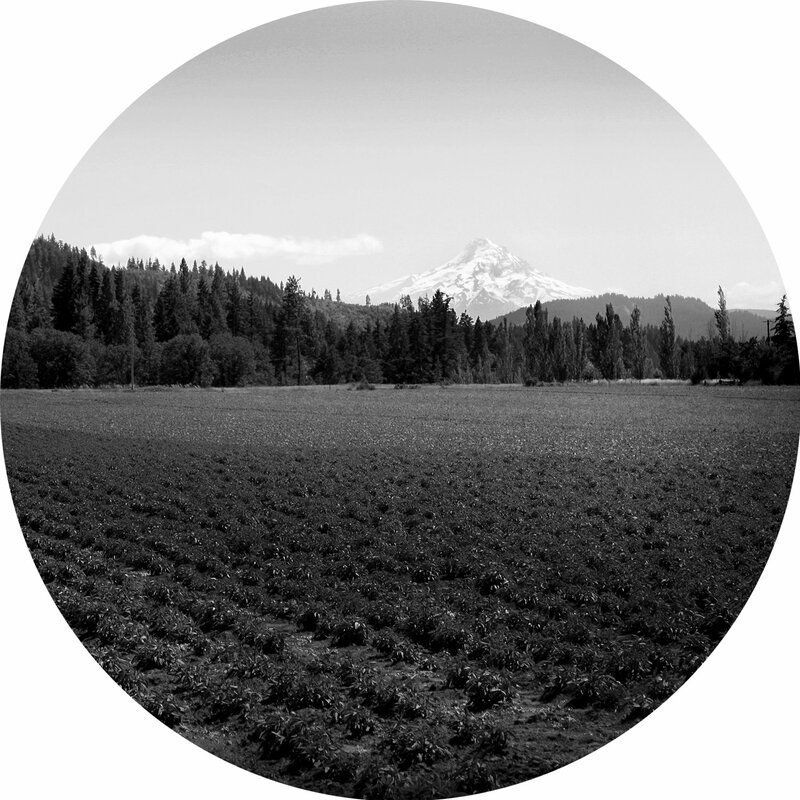 This wonderful article comes to us from Kristine Brown of the Herbal Roots Zine. 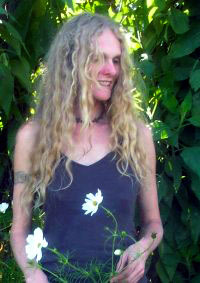 She has been teaching herbalism for nearly a decade and has studied plants for over 17 years. 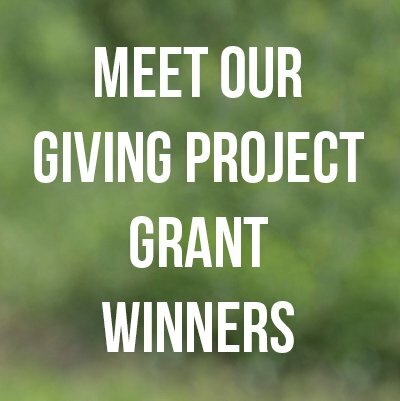 Kristine empowers her community by focusing on local plants that are easy to access and identify, gifting the knowledge and skill to harvest these plants for healthful purposes. In 2009, she began writing and illustrating the Herbal Roots Zine, a monthly publication for children. She also offers a monthly herbal study group, presentations for adults, and summertime workshops for kids. Thanks for sharing this, Kristine! Kids are the future, teach them well! Children are the best students when it comes to plants. They have no prejudice against any of them (except for what we teach them), no preconceived notions of how a plant should work or how its herbal qualities should be used. Just as we can accept an orange has vitamin C, a banana has potassium, and beans have protein, they can learn that peppermint is cooling and comfrey is helpful for the skin. And why not? They are all plants after all. Certainly if garden ‘vegetables’ can be nutritious and keep us healthy, so can herbs, weeds, and other plants. As adults we tend to be narrow minded when it comes to our food sources, but if we allow ourselves to open up, we can realize that this wonderful world we live on has given us an abundance of nutrition and healthfulness through the plants and didn’t just reserve it for a select few. All plants have importance and value. We herbalists, scientists, and the like have yet to discover them all. Nurture this attribute in children and reserve your opinions. Encourage them to keep an open mind as they grow to all the possibilities plants offer us. Let them learn for themselves. Teach them to trust their instincts. This doesn’t mean to let them eat anything, especially when it comes to fungi, however, when teaching them the difference between poke and elderberry, or hemlock and Queen Anne’s Lace, teach them respect of the plant and reverence for the qualities each plant offers whether it is mild (chickweed, lemon balm, plantain) or overly strong (foxglove, hemlock, etc.). Time will teach the appropriate use and application of each variance. Giving a good herbal foundation will stay with children for their lifetime. Knowledge is empowering. Even though the majority will not choose this calling as their lifework, they will have a solid foundation of herbal knowledge which they will one day be able to pass along to their friends, family, community, and children of their own. They will have the ability to take control of their own health and teach others to do the same. There is nothing more empowering than knowing you have the ability to take charge of your own healthcare. 1. 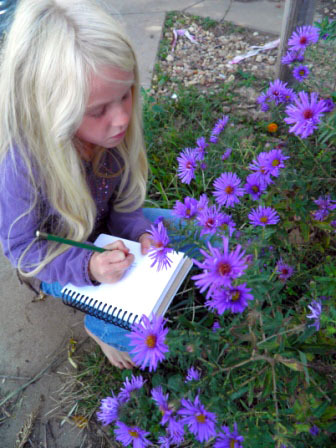 Start a notebook of the plants in your yard. Head outside with a notebook and make a list of each plant you have, starting with the common name and adding the Latin name if you know it or later when you can look it up. Have your child(ren) look around and tell you what they see first. Don’t forget the trees! Even if you don’t think a plant has herbal uses, write it down anyway. You’ll be surprised at the number of ‘just weeds’ that really are beneficial. Remember, all plants have value, some are just yet undiscovered. 2. Make some DIY herbal products. You might start with a few simple items such as making a salve and perhaps a tincture of Meadowsweet or Willow Bark to replace the aspirin. As your child(ren)’s knowledge grows, they may wish to make a salve for mildly irritated skin or other more nuanced purposes. Likewise, they may add tinctures for various types of occasional discomfort: skullcap, wood betony, dandelion, feverfew, and so on. The key is to start simply and have them build on that knowledge. 3. Assemble a home herbal DIY product kit. Study your list of plants growing in your back yard and ask your child(ren) which herbs could be helpful on the go? In the car? As they learn about the herbs that are growing in your yard, they can begin utilizing them in a variety of ways. 4. Start an herb garden in your back yard or in containers. Begin with a few simple herbs such as chamomile, mint, basil, rosemary, lemon balm. Let your child decide on 10 or so herbs that they would like to become familiar with. Have them help create the garden, pot the plants, weed the garden, and water regularly. Encourage them to work with the plants and observe them as they grow. Make sure they taste each plant regularly and record how the flavors change as the plant grows; Mint becomes extremely strong when it flowers, Dandelion leaves become bitter as they mature. Be sure to have them record all this information (see journaling below). Giving your children a part of the garden to grow their own plants is very empowering and also teaches them responsibility. They will take pride in growing their own botanicals, and when it comes time to use these healfhful plants, they will be more receptive to using it since it’s something they themselves planted, grew, harvested, and created DIY health products from. 5. Explore the herbs. As you work with the herbs, talk with them about the Latin names and the family they come from. Discuss characteristics of each family and similarities between plants. Have your child(ren) sample the herbs and state how that taste makes them feel (puckered, dry mouth, thirsty, etc) and what they think the plant may be useful for. Have them write down these ideas and put their theory to work the next time they have need to. If they are having trouble getting started, try offering them mint and say something like, “This helps to make your tummy happier. When you eat it, what else do you think it would be helpful for?” (freshen breath, pick me up, etc.). Encourage them to discover healthful uses through their own intuition. Never discourage them. If they say lemon balm would be good to stop bleeding on a cut, let them try the theory out the next time they get cut. If it doesn’t work out, offer some suggestions of plants that may be more suited (something more astringent such as yarrow or plantain) or ask what they think might be more suitable. 6. Keep a journal of experiences. 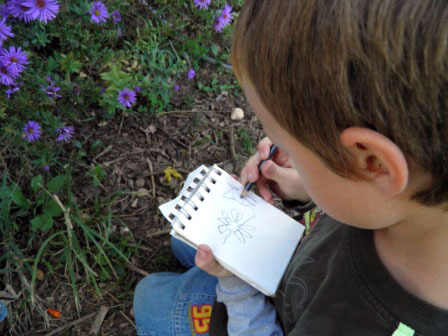 Have your child(ren) regularly sketch drawings of the plants’ progression over the course of the growing season, keep notes on the changes such as when they bloom, when they go to seed, etc. They can write down harvest information and any remedies you and they make with the herbs. 7. Have an herbal ally. Once your kids get more familiar with herbs, encourage them to pick one herb to learn about for 3 – 6 months to a year depending on their age. Have them focus on one herb and use it as much as possible, making as many recipes as possible from it and really getting to know it. Encourage them to be immersed in the plant, writing songs, stories, and poems about their ally. They should also be making as many healthful products as possible with their herbal ally: salves, tinctures, vinegars, elixirs, oils, poultices, compresses and so on. Even if it doesn’t seem to make sense doing this with a plant, have them try it anyway, even if it’s just a few ounces. 8. Use the herbs in every way possible. This seems like a given but a lot of people overlook this. Incorporate herbs with your everyday living. Experiment with dyeing clothing with plants. 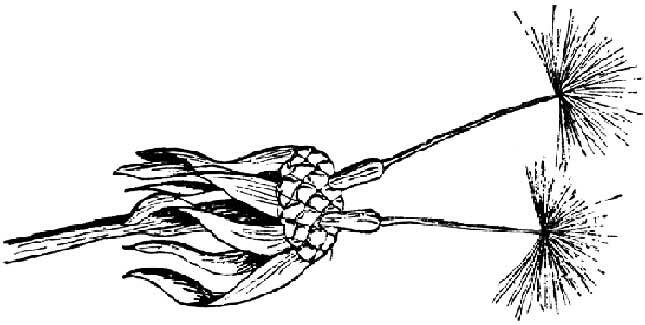 Use them in floral arrangements, crafts, nature tables, and other seasonal decorations. Eat them. Make them be an integral part of your life. 9. Play games. Wildcraft! from Learning Herbs is an excellent cooperative board game that will teach children about herbs. Other games such as Walk in the Woods can also be a good teaching tool. Look into getting knowledge cards from Pomegranate such as Herbs and Medicinal Plants, Darcy Williamson’s Medicinal Flower Cards or Linda Runyon’s Wild Cards. Also, although not herbal-based, it is a great tool for teaching plant families: Shanleya’s Quest book and card game. 10. Start a Herbal Library. 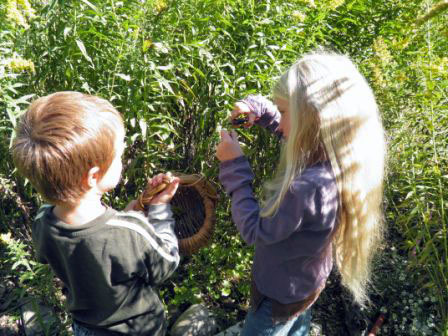 Offering a variety of books to children is a great way to let them explore herbs on their own. There are a few children’s books available and a wealth of adult herbals that are kid appropriate. For a complete list of books to stock your library with go to: http://www.herbalrootszine.com/herbal-learning-resources/ or visit Mountain Rose Herbs book section. Above all, be open to experiences and allow your child(ren) to participate in all your herbal endeavors. Weave a tapestry of herbal love and knowledge into your child(ren)’s lives by letting them observe and help. Even the smallest child can add the oil to the double boiler to make an infused oil or help strip herbs from stems. And when they grow tired of the task, let them move on to another while you finish up what you are working on. In time, they will naturally start helping longer and eventually take over some of the herbal DIY activities in the home, creating their own recipes as their knowledge grows. Always gently nurture this and remind them to keep records of their experiences. Remember, no matter what, they are always learning!